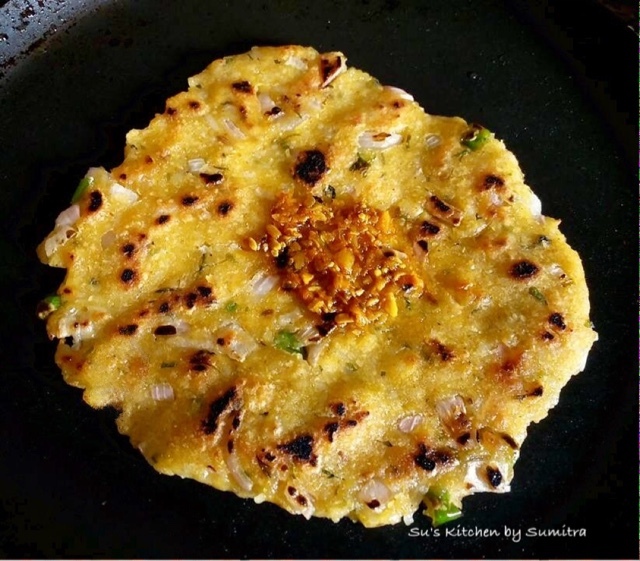 Akki rotti is a rice-based dish, extremely popular from the state of Karnataka.It is made of rice flour which is mixed with salt and water and kneaded well to make a soft dough. 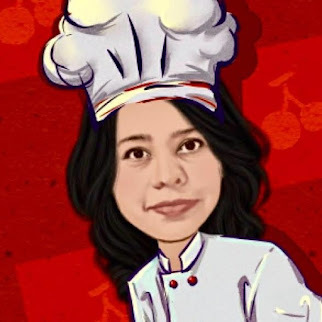 Sliced onions and carrots, chopped dill leaves, chopped coriander, cumin seeds and sesame seeds can also be added while kneading the dough.Traditionally some oil is spread on the skillet and a small amount of the dough is place on the skillet and spread to a thin sheet. Oil is then drizzled on the the Rotti. It is cooked until the Rotti is brown on both the sides. It is served hot and is eaten along with chutney. 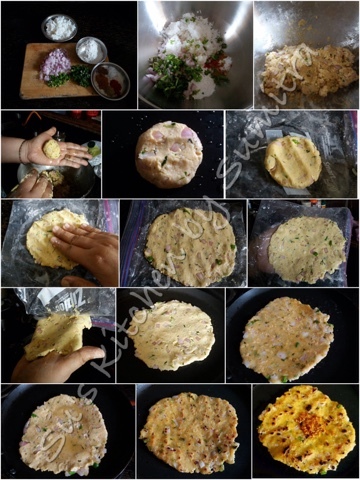 Another way of making akki rotti is to spread the dough over a plantainleaf or a plastic sheet and then cooked on the skillet. The dough should be made just when you are making the rottis. Here I have made it with leftover rice and rice flour with onion, green chill, coriander leaves and spices. Mix all the above ingredients except oil well and form a dough. Add a tbsp of oil and knead it well. If the dough is sticky add more rice flour. Take a lime size portion of the dough. Roll it into a ball. Take a plastic sheet. Apply water on the sheet. Place the ball on the sheet and with the help of the finger start pressing the ball and spreading it. It will be sticky, apply water on the fingers. Heat a skillet, very gently left up the plastic sheet, turn it upside down and with the other hand remove the plastic sheet out. The Rotti may crack. Place the the Rotti on the skillet and seal the cracks. Cook the Rotti for 2 minutes. Trun it. Drizzle it with oil. Cook it till brown on both the sides. Serve hot with chutney.